We conclude this short series of Christmas themed films that are considered classics for one reason or another. 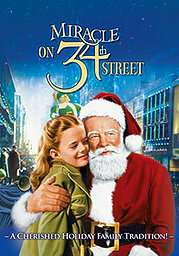 Today we end with Miracle on 34th Street. 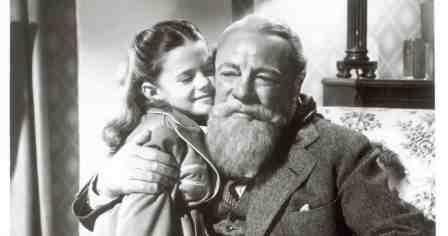 Miracle on 34th Street is a genuine American movie classic that today is ranked at number nine on the American Film Institute’s 100 Most Inspiring Movies. 20th Century Fox studio head, Darryl F. Zanuck, didn’t like it. He considered the script too corny and was against the film being made. Knowing that director George Seaton was eager to make the film, Zanuck saw an opportunity. He had Seaton sign a contract stating that if the director would accept his next three projects at the studio without question, he could make Miracle. A desperate Seaton agreed and signed the contract. Maureen O’Hara wasn’t so keen about the film, either. She had to be forced into accepting her role as Macy’s events director, Doris Walker. O’Hara was in Ireland and was not interested on returning back to America to make another film. However, after she read the script she changed her mind at once and made it back to the States. The scenes revolving around Macy’s Thanksgiving Parade were filmed during the actual parade. Actor Edmund Gwenn, who played Santa Claus in the movie, was the actual Santa in the 1946 parade, waving to the crowd and fulfilling all the obligations that every Santa needs to fulfill when playing the part of the big guy. Both Macy’s and Gimbels were asked by the studio for their permission to be used in the film. Both stores agreed, but on one condition – they both wanted to see the finished product before final approval. This caused the studio a major headache. If either of the two stores disapproved of the film and wanted their names pulled, much of the film would have to be re-shot. Fortunately, at a preview, Macy’s and Gimbles were happy with what they saw, and no changes were required. 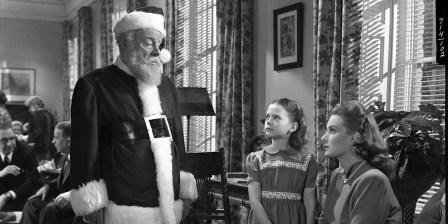 Even though Miracle on 34th Street is obviously a Christmas film, Darryl F. Zanuck wanted the film released in May. His argument was that more people went to the theaters in the summer, not the winter, so the promotions department had to rush around trying to find a way of promoting the film without letting on that it took place at Christmas. 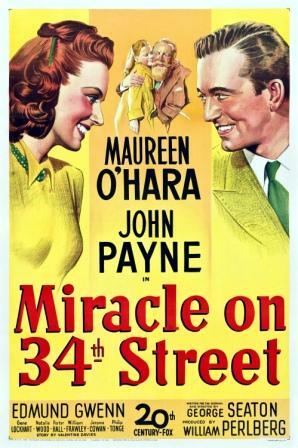 The film’s original theater posters show Maureen O’Hara and her leading man, John Payne, dominating the foreground while Edmund Gwenn’s Santa is relegated to the background. Over the years, Miracle has become a much beloved film and has even inspired three television film versions, a 1963 Broadway musical called Here’s Love, and a 1994 theatrical film version with Lord Richard Attenborough as Santa, but it is still the 1947 original starring an eight year old Natalie Wood that continues to inspire and capture our imagination.